Today and tomorrow are the days we are celebrating Thanksgiving in my Kindergarten classroom. Historical accuracy is important to me, so I try my best to teach the students the history of the holiday. I also did some research on what foods would have or could have been present at the first or second Thanksgiving. 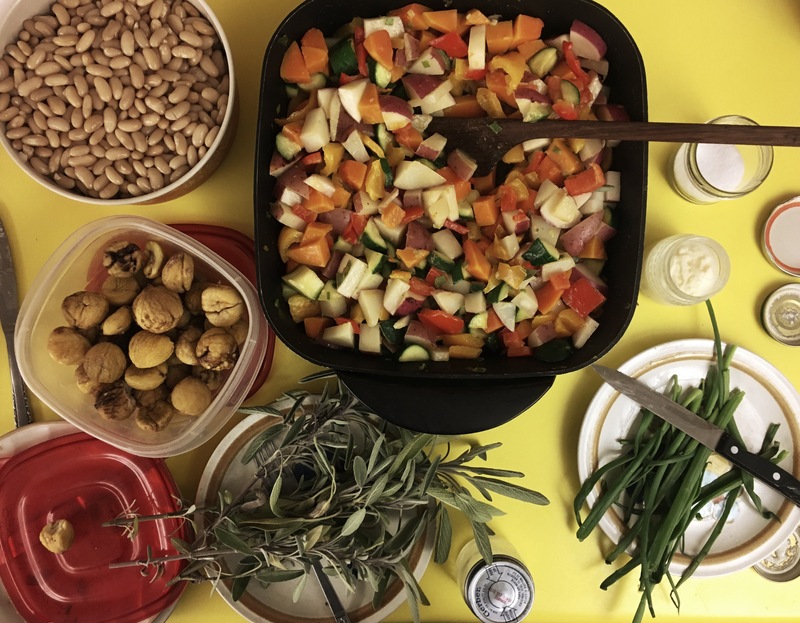 Beans, corn, and squash were on my menu, as well as chestnuts. I cooked up mayacoba beans and roasted and laboriously peeled chestnuts. To keep this fun day trash free, all ingredients were package free, and I brought plates from home for the students to eat from. I always have a small set of silverware at school. They ate in turns, like rotating stations, and I simply washed the plates and forks in between rotations. 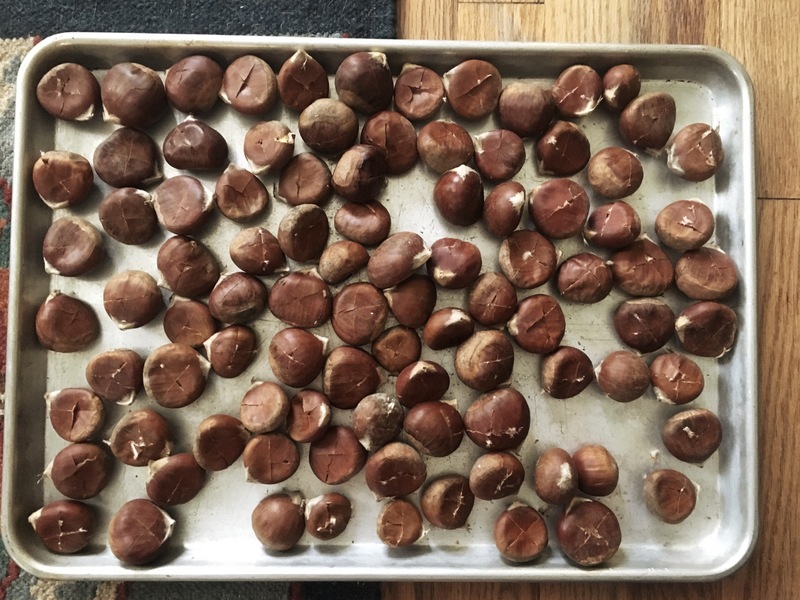 To cook chestnuts: score an X on the flat side, through the shells and slightly into the meat. Bake at 425 Fahrenheit for 20 minutes, then peel. My fingernails are still suffering from the process, but I had never even tried a chestnut before yesterday, and I have to say it was worth the pain. They are delicious! Nutty and sweet, and softer than expected. The students made butter from cream by shaking it in a baby food jar; even though that part is not historically accurate, it’s too much fun not to include in the day’s activities. They chopped bell peppers, zucchini, potatoes, and green onions. The night before, I prepared a butternut squash from my garden and took it with me to add to our vegetable medley. I don’t eat meat and so I would never buy it for my students. I wouldn’t know where to purchase venison anyway. I keep a plug in skillet at school for such occasions. It was given to us by a family member and it’s not something I would use at home. I have control over what kind of festivities happen in my classroom, and I expect them to align with my values. I composted scraps and am feeding any leftovers to my hens. Basically a trash free classroom party! Produce stickers and napkins were tossed. I get a stack of napkins each time the vegetable grant comes to my room, so I feel that I should use those. How would you implement zero waste into the classroom?